As smart as they are, doctors can’t compete with the volume of knowledge that a robot can retain. In an effort to join the best of both worlds – human experience with robotic data – a number of companies are developing telemedicine robots that not only allow doctors to reach out to patients miles or continents away, but can offer immediate information and advice that draws from volumes of medical research and case studies. In January the FDA approved the telepresence platform RP-Vita, developed by iRobot and InTouch Health. Now seven hospitals across North America have enlisted the services of RP-Vita, bringing us one step closer to robotics-augmented healthcare. The company recently announced that seven hospitals in the North America are using RP-Vita: Dignity Health, Sacramento, CA; Hoag Memorial Hospitial Presbyteria, Orange County, CA; Providence Saint Joseph Medical Center, Burbank, CA; Ronald Reagan UCLA Medical Center, Los Angeles, CA; St. Mary’s Medical Center, Huntington, WV; Ohio State Wexner Medical Center, Columbus, OH; and Instituto de Salud del Estado de Mexico, Toluca, Mexico. The telepresence platform will be used by doctors to look in on stroke victims located at distant hospitals. 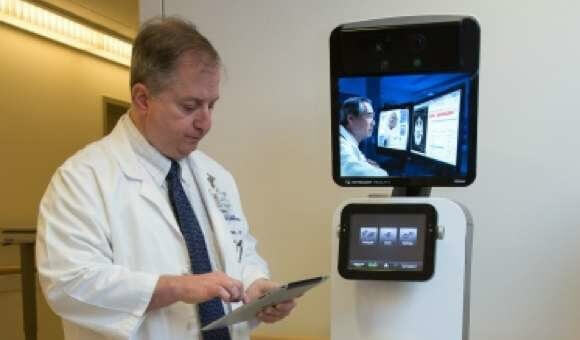 With the push of a button on an iPad the doctors can direct the robot to the patient’s bed. Thirty sensors allow it to navigate the busy hospital hallways, automatically avoiding personnel and obstacles. If need be, the robot can plot an alternate course to reach its destination. Once with the patient, the telepresence interface allows the doctor to check on the patient as if he or she were in the room and determine the right course of action. A two-way video allows the doctor and the patient to see and speak with each other. And with a zoom feature the doctor can read the patient’s chart and even check his or her eyes for dilated pupils. Telepresence robots are all the rage these days. Homebound students are sending robots to the classroom for them, avatars are showing up at office meetings, and iRobot is just one of several companies attempting to augment doctors’ powers by allowing them to be in two places at once. The telepresence marketplace is one that grows continually more crowded with iPads on wheels. But with RP-Vita’s FDA approval and the tracks it’s now making down the hallways of seven North American hospitals could leave the competition in the dust.